In Chicago Rahm Emanuel has closed 50 “underutilized” public schools and is rapidly replacing them with charter schools. The unelected board of education (CPS) will consider 21 total charter applications on January 22nd. Additionally, a stacked, special “charter school funding task force” put together by Springfield lawmakers and led by State Rep., Dan Burke, will come out with their “findings” prior to the general assembly returning to session (Jan 28th). We expect that Dan Burke will be recommending more money for charter schools – big surprise (possibly at a Jan 13th task force meeting). And, what a waste considering that the “too broke to pay the bills and pensioners” general assembly gave UNO (in Dan Burke’s district) $98 million dollars that was wasted on scandal-riddled construction projects. The hedge fund managers and their politicians (Rahm, Rauner, Madigan, etc.) 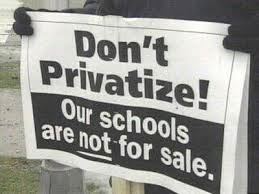 are not going to stop their privatization assault on public schools so we need to push back. You can help by attending and bringing a friend to either the Jan 14th event in Chicago, or the second event in the suburbs scheduled on Jan 23rd. When did it become acceptable to take money from old people? I first heard Pat Herrmann, a retired art teacher from Wheaton, Illinois, ask the question, “when did it become acceptable to take money from old people?” during a public pension discussion hosted by the DuPage Coffeehouse. Herrmann is a deep-thinking activist. 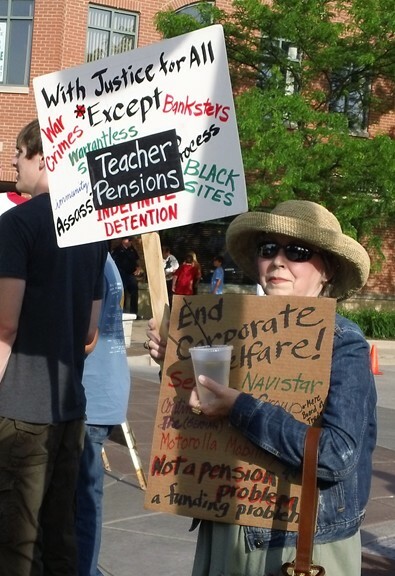 The multiple messages on her signs reflect her ability to conduct careful research and see the bigger picture. Her question about taking money from old people reflects her ability to see the human impact; something lawmakers don’t see. As the Illinois General Assembly debates how much money they will strip from Illinois teachers’ pensions and President Obama puts deep cuts to Social Security on the table, I was reminded of Hermman’s important question. If you have not signed the petition to tell President Obama to take Social Security cuts off of the table, now would be a good time to do it by following this link. Of course those reaching into the pockets of old people don’t want to talk about how this will impact living, breathing human beings. They want to talk about numbers, budgets and other inhuman things. Consider Tom Cross’s recent letter to the Chicago Tribune that makes this all sound like a tragic math problem. Cross, after 20 years in Springfield, takes no responsibility for the state’s past 40+ years of delinquency. I am not giving Democrats a free pass on this either. 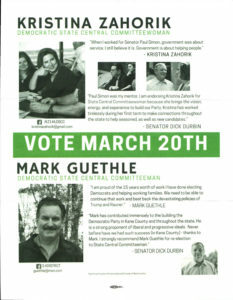 The primary drivers of pension reform in Springfield are Mike Madigan, Pat Quinn, Elaine Nekritz and Dan Biss (all Democrats). All of them, Democrats and Republicans, are singing from the same sheet of music. Watch the video of Bernie Sanders below the fold. Money Grab: Heather Steans, Chicago School Closings and K12 Inc.
State Senator Heather Steans and Stand for Children are ultimately responsible for Chicago school closings and the recent increase of charter school applications like the 18-district virtual charter initiated by K12 Inc. in the Chicago suburbs. I started researching SB79 and HB 5825, the legislation that created and gave the Illinois Charter Commission super “override powers” and autonomy from the Illinois State Board of Education (ISBE). If SB7 gave education activists concern, SB79 and HB 5825 should have started a five-alarm fire. Because of SB79, K12 Inc., a for-profit, Wall Street-traded company applied for a virtual charter scam in 18 suburban school districts. Why are they doing this? K12 Inc. anticipates that the state charter commission will override local rejections of their taxpayer rip-off scheme and approve the charter despite overwhelming local opposition. The Chicago Teachers Union is currently on the front lines of a fight to defend public education. On one side the 30,000 members of the CTU have called for a contract that includes fair compensation, meaningful job security for qualified teachers, smaller class sizes and a better school day with Art, Music, World Language and appropriate staffing levels to help our neediest students. On the other side, the Chicago Board of Education—which is managed by out of town reformers and Broad Foundation hires with little or no Chicago public school experience—has pushed to add two weeks to the school year and 85 minutes to the school day, eliminate pay increases for seniority, evaluate teachers based on student test scores, and slash many other rights. Teachers, parents and community supporters in Chicago have fought valiantly—marching, filling auditoriums at hearings and parent meetings, even occupying a school and taking over a school board meeting. Most recently, 98 percent of our members voted to authorize a strike. But now we find ourselves facing new opponents—national education privatizers, backed by some of the nation’s wealthiest people. They are running radio ads, increasing press attacks, and mounting a PR campaign to discredit the CTU and the benefits of public education. 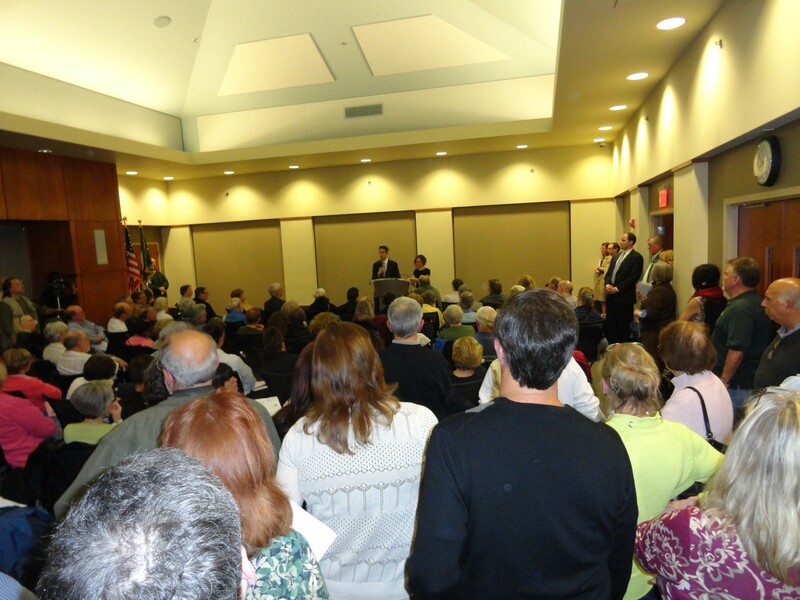 State Rep. Daniel Biss had the courage to hold a town hall meeting to discuss “pension reform” in Glenview on April 30th. I estimate that 200-225 people attended the overcrowded room that was set up to accommodate 75 people. 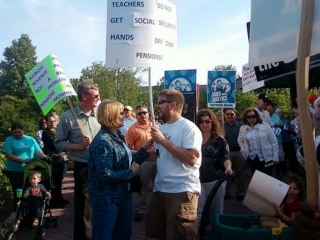 The standing room only crowd was a mirror image of other pension discussions happening around the state. The general mood of the cramped, “slightly too warm for comfort” room was polite and respectful. Biss set the tone by taking questions and respecting diverse opinions while facilitating the conversation artfully. I attended the event because I felt that if Representative Biss had the courage to hold a controversial town hall meeting that he might also have the courage to lead a fight to actually fund pensions and uphold the state’s end of the deal.